GLASGOW • Simone Biles confirmed herself as the overwhelming favourite ahead of next year's Olympics when she became the first woman to win 10 world gymnastics championships' gold medals. On Sunday, the 18-year-old American added golds on the balance beam and floor to the all-around and team titles she had already claimed at Hydro Arena in Glasgow. This was her second straight "four-peat" and she became the first woman since Russia's Svetlana Khorkina in 2003 to win three all-around titles. She is also the first to win three in a row after Antwerp in 2013 (her debut ) and Nanning in 2014. She overtakes Khorkina, Romania's Gina Gogean and former Soviet gymnast Larisa Latynina, each with nine world titles. 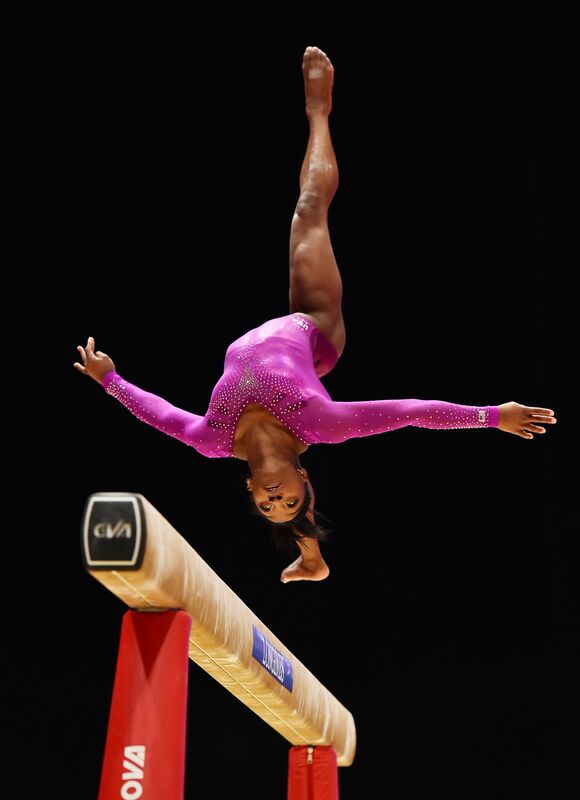 Days after what her coach Aimee Boorman called "the save of the century" in the all-around final last Thursday - when Biles grabbed the four-inch-wide beam with both hands to avoid falling off - the teenager from Texas gave a near-flawless display on the same apparatus. She was rock-solid as she spun around 900 degrees on her right toes and flew through her acrobatic flips and somersaults. When she nailed her full-twisting double-back somersault dismount, Boorman was leaping in delight. "It hasn't sunk in yet," said Biles, the tiny 1.44m-tall star with the infectious giggle. "It was one event to the next so I had to run back (after beam) and warm up." In her final competitive performance of 2015, she succeeded in her aim to "end it with a bang" by producing a dazzling, hip-swinging floor exercise. Her explosive tumbling passes - which included her trademark soaring double layout with half twist at the end - and sassy moves were beautifully choreographed to the music of Doris Day's Perhaps, Perhaps, Perhaps. A score of 15.800 made her the most successful women's gymnast ever. She said: "I know what I achieved and that is unbelievable. "I am proud of myself." Nothing has come easy for Biles, who was born in Columbus, Ohio and moved to Texas at the age of three to be brought up along with her younger sister by her grandparents Ron and Nellie. The couple adopted the children after their mother was wrestling with drug addiction. Two other siblings were adopted by Ron's sister. Biles calls her grandparents Mom and Dad and both were cheering in the stands in Glasgow. "My Mom takes my medals from me and puts them in a safe, and I don't know the combination," said Biles, who will compete in her maiden Olympics in Rio. There, she will bid to topple team-mate Gabby "Flying Squirrel" Douglas, the reigning all-around Olympic champion, who took two years off after the London Games and returned to take silver behind Biles in Glasgow. "Three years ago, I would have thought they were absolutely crazy and wouldn't have believed it," said Biles, when asked if she was now favourite for the Olympic gold. With a vault bronze on Saturday, she now has 14 world medals, surpassed only by Khorkina's 20 between 1994 and 2003 and Gogean's 15 from 1993 to 1997. Biles is equal with Latynina, who won 14 between 1954 and 1966. It was a performance that put the United States on top of the medal standings with five golds, ahead of Japan with four on the final day of the competition. Said Biles' team-mate Maggie Nichols, who took bronze in the floor event: "Simone did amazing as she always does. "It is amazing watching her, cheering her on and her, being my best friend, I'm so proud of her and of everything she has accomplished."